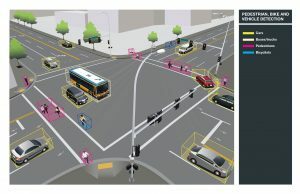 The City of Bellevue, in partnership with Microsoft, the University of Washington (UW) and a number of cities, private sector companies, research universities and nonprofit organizations, is launching a new partnership- Video Analytics Towards Vision Zero- which aims to use footage from traffic cameras across North America to “teach” computers how to recognize near-miss collisions. Computer images showing how the Video Analytics partnership will leverage existing traffic cameras to generate count reports. Launching today, the partnership is developing a video analytics platform which leverages cloud computing and machine learning systems to convert raw video footage from the City of Bellevue’s existing camera network into useful data that can be searched, managed, and used to provide detailed information on traffic flow and allow a more rapid response to non-crash traffic conflicts. The potential of the project for saving lives is significant. In 2016, road crashes resulted in approximately 40,000 deaths and 4.6 million injuries in the United States alone. For young people under age 19, these collisions were the leading cause of death. Understanding the root causes for near-collision events could enable local governments to take proactive, corrective actions to reduce the potential for future crashes. Performance dashboards are under development in the Video Analytics Towards Vision Zero Partnership to flag high-risk locations that warrant intervention. The dashboards are based on a predetermined, numeric scale of near-miss conditions. A higher score indicates a higher risk of collision, adjusted for the number of road users passing through the intersection. In terms of human lives and property damage, near-collision events are zero-cost learning opportunities, compared to learning from actual crashes and their grim consequences. In order to ensure the success of the program, the project is looking for people to use a crowd-sourcing tool to analyze video and teach computers to identify a person in a wheelchair, on a bike or in a car, as well as patterns of movement in intersections. The more people who take part, the better computers will learn to recognize near-miss collisions. If you would like to learn more about this partnership, and participate in the crowdsourcing initiative visit this website or contact Franz Loewenherz, for additional information. Special thanks to the Video Analytics Towards Vision Zero Partnership for the graphics and content used in this post.